One of the most common questions we get is how to calculate keyword value when budgeting for an SEO campaign. It’s a sensible question and plays a tremendous role in being able to evaluate and forecast ROI for certain SEO services. The trouble is, there is no real way of calculating keyword value with complete accuracy. We use a few available keyword datasets to estimate the value of SEO keywords but are the first to point out these numbers are only best-guesses. This article shares a couple of key considerations, some historical search data, and how we advise our clients to approach keyword value estimation. To create a formula for the accurate calculation of anything, one first needs data to draw insight from. For estimating keyword value, the data we use is an aggregate of past studies produced by various agencies. These studies have investigated how users interact with the Google search results page (SERP) and forecast estimated click-through-rates (CTR) based on position ranking. Being able to estimate the CTR of results in the search results allows estimation of the value of ranking there. That’s to say; if you can estimate how many site visitors you might get from ranking number one for a keyword—you can estimate how much that keyword is worth. Google is notorious for operating behind closed doors, offering little insight into their algorithm functionality or user data. To get the type of insights needed to make accurate keyword value estimations, we’re forced to rely on a handful of studies from agencies and companies that have access to relevant user interaction data. There have been a handful of these studies in the past few years, but the length of their relevancy is greatly reduced by Google’s constant adjustment of their algorithm, the addition of new search features like Local Packs, and the ever-increasing shift towards mobile. We use averaged numbers from each of these studies to help better account for variability, but each is able to offer some value on their own. Below, you’ll find a brief overview of the most relevant SERP CTR studies to date, and the insights they provide for estimating SEO keyword value. In our opinion, this set of general keywords not being actively monitored by SEO tracking likely paints a more accurate picture of practical search user behavior. When we do keyword value calculations, a significant amount of weight is placed on the insights gathered from this study. This survey uses data produced by proprietary Chitika technology, and avoids relying as heavily on data provided by Google. This study was conducted in late 2010 among 250 buyer to buyer (B2B) and buyer to consumer (B2C) websites that encompassed nearly 10,000 keywords. 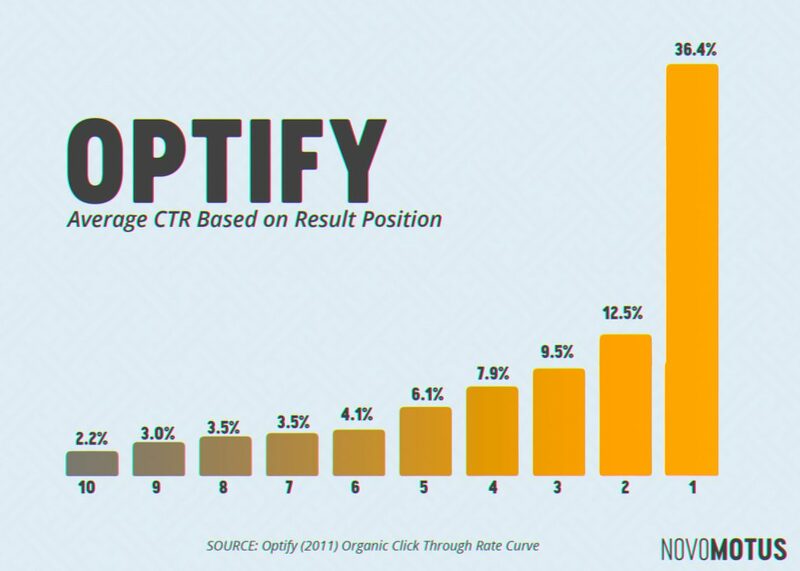 The general takeaway from this data was that being on the first page is critical, being in the top 4 results is vital for profound returns, and being the 1st result in the SERP will result in more traffic than the 3rd-10th positions combined. Again, this data was biased towards more commercial intent as it was provided by website data from commercial clients, presumably monitoring keywords more highly favored towards commercial intent. For a long time, this dataset was considered the gold standard for keyword value estimation and CTR trends among online searches. A lot has changed since then, especially in the past few years, but it’s remarkable how similar search trends were among this data and similar data collected nearly a decade later—from a different search engine! 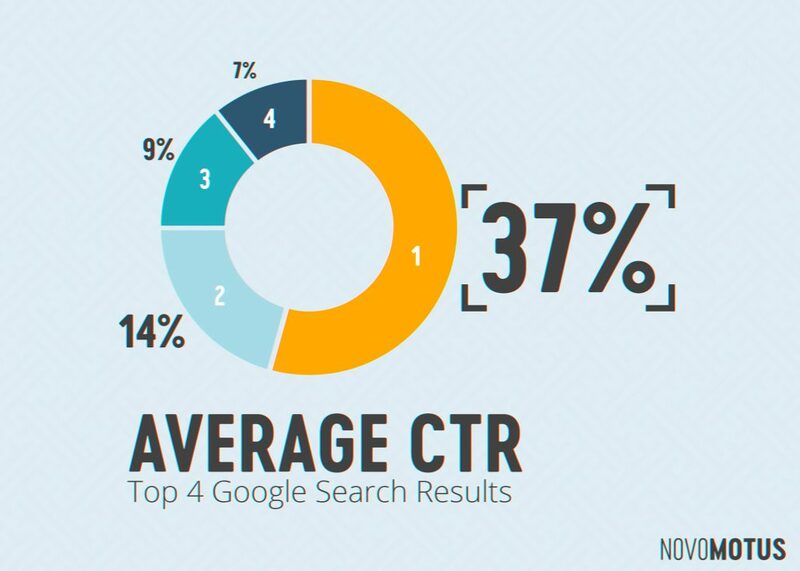 In addition to these insights, the 2013 Catalyst study investigated differences in mobile vs. desktop searches, branded vs. non-branded searches (non-branded had higher CTR actually), CTR of informational searches, and CTR of coupon and discount code type searches. They found that mobile searchers tend to be more likely to click the first result, coupon-related searches are more likely to click the first result, and that navigational type searchers typically click the first 2 results. It should be noted, this was before Google’s Local Pack SERP feature was seen in such heavy use as it is now. Overall, this study offered valuable insight into the impact of different types of user intent on CTR, but in our opinion isn’t too useful in making practical predictions for average searches. This provides us some more practical values, for which we can estimate overall keyword value. 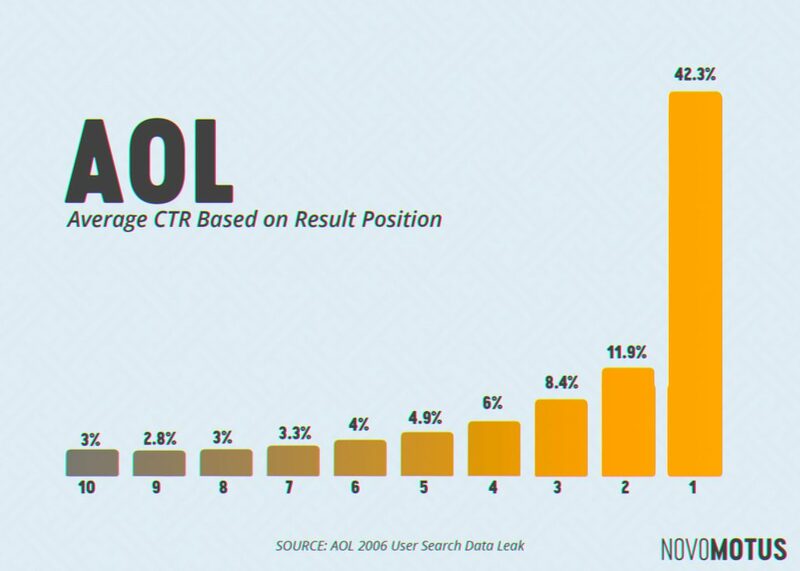 The average first position value is very illustrative of the power of SEO campaigns. Ranking in the first position for a target keyword can be worth more than having a result in nearly every other position on the first page. 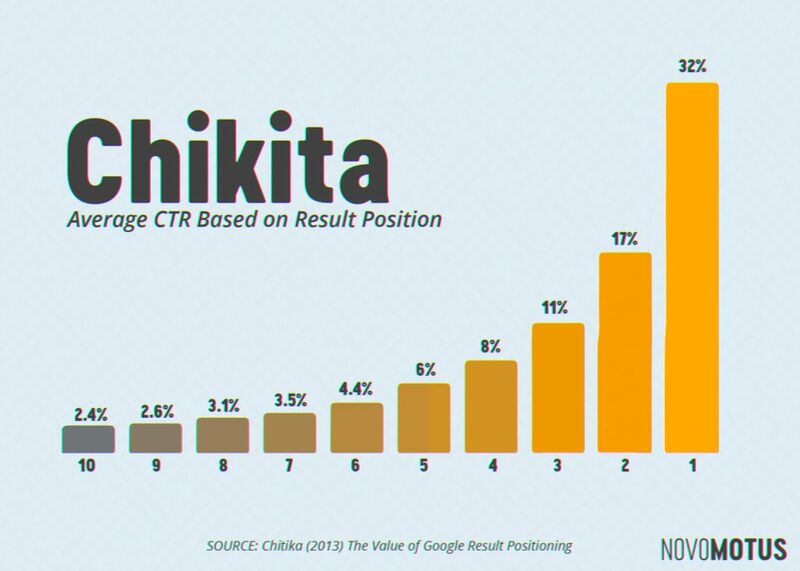 In practical applications however, we find that ranking fluctuations are often better accounted for by estimating with average CTR for the top 4 positions. From the above table, these values would be 37% and 17%, respectively. As you can see, the keyword isn’t worth nearly what the entire United States keyword would be, though Local Packs make it somewhat irrelevant to target now anyway (for now). These examples illustrate how using the keyword calculation formula can provide useful estimates of overall keyword value, and can help budget for your SEO campaigns more appropriately. For example, a local car insurance broker in New York would have to spend $40,000 per month to get the number of clicks they could expect from ranking in the first position for cheap car insurance for local searchers. When budgeting for their SEO campaign, they could invest $150,000 and be ROI positive (from a CPC perspective anyway) after the first 4 months of ranking number one. After ranking number 1, they would essentially be getting $40,306 of targeted traffic to their website each month—without spending any more money! This is why SEO is such a powerful tool to help businesses grow, and why sometimes a little bit of risk is worth taking. The relevant data for keyword calculation certainly has its flaws and is to be used only as an estimate. User behavior is unpredictable, and technology interfaces have been rapidly changing. In 2006, there wasn’t a notable presence of mobile users conducting searches within the AOL datasets. In 2011 even, mobile technology likely had little impact on the Optify study. More recent studies such as the Hitwise Mobile Search: Topics and Themes report estimate that mobile searches average as much as a 60% share of total searches. Google itself has now implemented real-time changes in ranking, with much more volatile position changes being reported by webmasters than in past years. Other newer search features such as featured snippets, local packs, and instant answers all play a role in affecting these statistics as well. When using this data, it is best to aggregate as much as possible to normalize for fluctuations. An example of this would be estimating value in keyword groups rather than individual keywords. Estimating keyword value can help make SEO campaigns much more profitable and rewarding for any business. There are no concrete ways to put a value on a keyword, but by taking into account past search user datasets we can compile useful formulas that provide workable estimations. We also advise our clients to take into account as much data as possible and to always be cognizant that Google makes changes that affect the CTR of searches. As a practical measure, we usually estimate keyword value for our SEO services by using search volumes for keyword groups and use an averaged CTR (17%) for the first 4 positions to account for fluctuations in ranking. We find this to offer an additional layer of accuracy, but still often falls victim to Google’s algorithm changes or new search features.